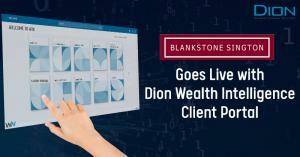 Blankstone Sington, an Investment Management,Stockbroking firm in Liverpool, have successfully launched Dion's Wealth Management Client Portal to end investors. LEICESTER, UK, UNITED KINGDOM, April 10, 2019 /EINPresswire.com/ -- 10 April 2019(UK): Dion Global Solutions (Dion | BSE: 526927) the leading supplier of modular Wealth Management solutions in the U.K., today announced that Blankstone Sington, an independent Investment Management and Stockbroking firm based in Liverpool, have successfully launched their Client Portal to end investors. The Client Portal is provided and hosted by Dion as part of their Wealth Intelligence (WIN) platform. Liverpool based Investment Managers and Stockbrokers Blankstone Sington was founded by Michael Blankstone along with his business partner Reggie Sington in 1976. An independently owned private client boutique that’s not lost sight of its heritage in traditional stockbroking, but has evolved into a modern, forward thinking investment manager. As a firm they reflect the same determination, entrepreneurial spirit and “can do” attitude that have cemented Liverpool’s place in the history books.